The ART Dual Transformer/Isolator Hum Eliminator uses a pair of high-performance transformers to totally separate input and output signal grounds, thereby isolating the 2 systems and reducing hum and ground-loop noise. 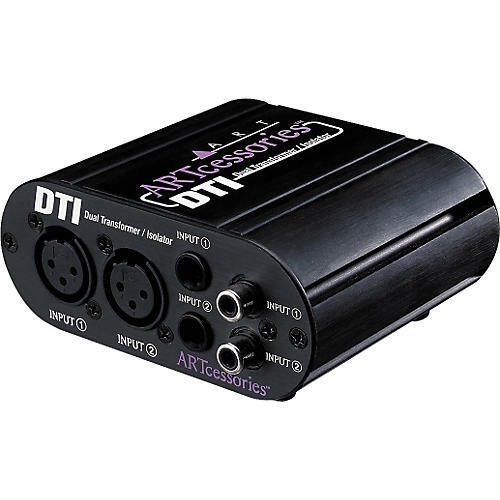 The ART DTI's audio transformers have an extremely flat and wide frequency response and can handle high signal levels while maintaining an isolated balanced output. This gives the ART DTI a very clean and neutral sound with a wide variety of signal sources. The transformers are wound for 1:1 unity gain and are designed to be used with impedances from 600 ohms to 100kOhms. XLR, 1/4" phone, and RCA type phono connections on all inputs and outputs. In general - one year warranty for equalizers, power conditioners, and personal processors. 3 year warranty for TPS, DPS, and studios. 5 year warranty for pro gear.